SurveilStar is the best Skype monitoring software that secretly records all Skype incoming and outgoing text chats. SurveilStar Skype monitoring software is not a simple IM recording tool. It is an intelligent Skype recorder that logs the exact chat messages, including Skype user names & emails, timestamps of their chats, and full length instant message conversations. It retrieves their chats even Skype's History archive is disabled. SurveilStar runs in a complete invisible mode so that users won't know its existence. You can check all recorded messages by simply receiving emails or opening a web page. Perfect for catching cheaters, monitoring employees, children or spouse, and even investigating crimes. A 30-day free trial version of this professional skype tracking software is available. Feel free to download and try to check skype chat messages of your employees and children. You can show all Skype messages in SurveilStar directly, export these messages to HTML files in a directory for later analysis. Everything will be recorded without being detected. SurveilStar Skype monitoring software is especially useful for administrators or parents, who need to know what their employees or kids are care and talking about with others. You can download SurveilStar and take a 30-day trial before order to make sure it works for you. The trial version allows you to monitor 5 computers. How to Setup a Policy to Monitor Skype Usage? SurveilStar's IM File Transfer Policy is used to monitor and control all outgoing files through Instant Messenger applications, such as Skype, MSN, and ICQ. It can block suspicious file transfer via any of these IM tools, by file name, file size, or file extension. For instance, you can tell SurveilStar to filter a document named “Q2 Financial Report” and block it from being transferred via Skype. Or you can tell SurveilStar to filter all Microsoft Document files, which are with the file extension of .doc, and block all attempts to transfer any .doc file via Skype. Here we are going to show you how easy to set an IM file policy to block outgoing file throught Skype using SurveilStar Console. How to Retrieve the Skype Outgoing Backup File? SurveilStar automatically records and saves the Skype chat conversations and instant messages for your later review. 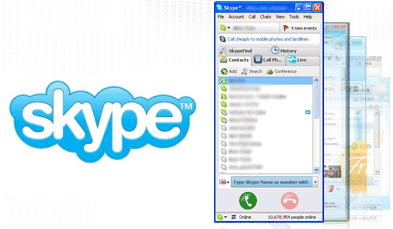 The recorded Skype contents can be saved in .htm or .html format. 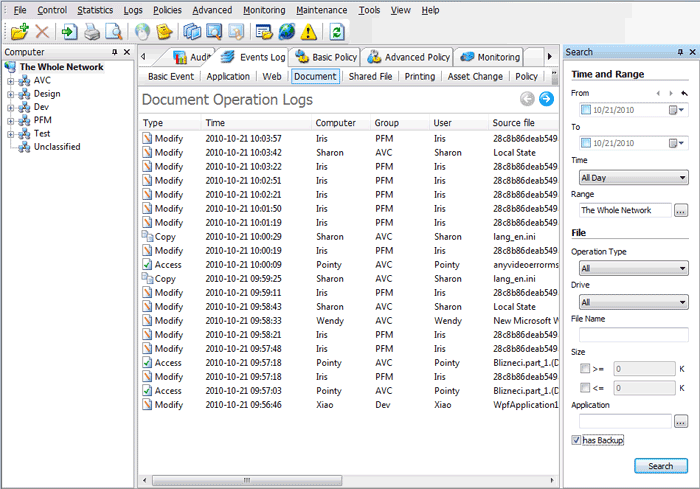 Supervisor can search Skype records with specified keywords. Go to the Search panel, check "has Backup" option, and then click Search button to start searching outgoing Skype files. How to Monitor Skype Chat Contents? Go to the Search panel, define time and range, select SKYPE instant message tool, enter UserID, Nickname, or content to search specific Skype message.